On January 16th, a small group of area non-profit, medical and business workers traveled down to the state capital of Charleston to meet with their representatives and discuss some of the most pressing issues facing Thomas, Davis and the rest of Tucker County. The day kicked off at the morning session of the State Senate, with Senators taking part in the ceremonial vote to declare the day “Tucker County Day.” A group of boys from the Rubenstein Center in Davis provided flag bearing duties, and the two State Senators representing the district that includes Tucker County, Randy Smith and Dave Sypolt, each gave brief remarks. From there, the Tucker County group spent several hours darting from meeting to meeting across the State House campus. They started with a morning meeting with Smith and Sypolt that followed the adjournment of the Senate session. The afternoon saw two sit-downs; first with representatives from the Division of Highways and then West Virginia’s recently appointed Secretary of Commerce, accompanied by the representatives from the Division of Natural Resources and West Virginia Tourism. The meeting with Smith and Sypolt focused on EMS funding and a possible hydroelectric dam in Tucker County, while the Highways meeting looked at the upcoming work on Corridor H as well the high number of trucks driving through downtown Thomas. The Commerce meeting looked at possible improvements coming to Blackwater Falls and Canaan Valley Resort State Parks, along with the state’s overall tourism branding. The day concluded with a reception held in the state’s Culture Center, featuring booths from a variety of Tucker County businesses and drinks from Thomas favorites Mountain State Brewing Company. The reception was particularly focused on the growth of medical facilities in Tucker County, with booths from Cortland Acres in Thomas and the St. George Medical Clinic. Other represented groups included the City of Parsons, Woodlands Development Group, and the Tucker County Convention and Visitors Bureau, as well as appetizers catered by the Canaan Valley Resort. 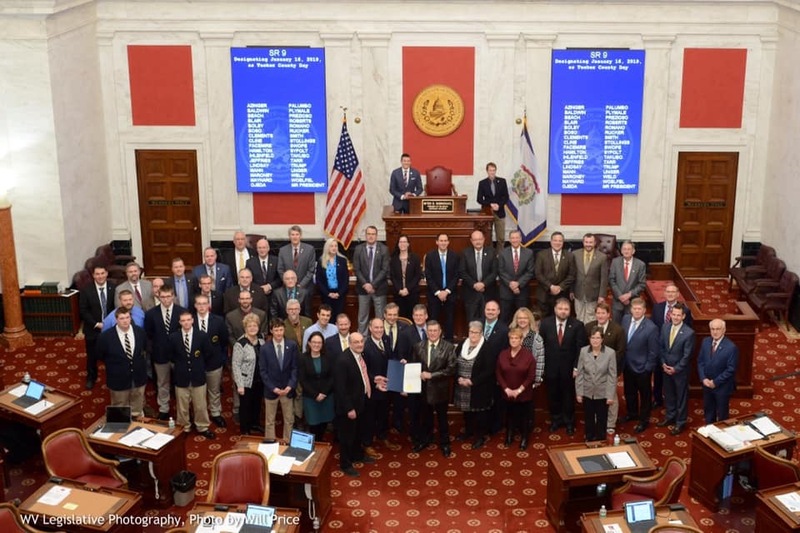 Each of West Virginia’s 55 counties have the opportunity to have their own “day” in Charleston, although many either combine with neighboring counties or don’t use the opportunity. While reportedly not as well attended as in previous years, the Tucker County Day reception has become a particular favorite of representatives in recent years, in part because of the free beer from Mountain State and Stumptown Ales.